UPDATE:The Iraqi officials have started to transfer the knowledge they gained from this workshop to their colleagues in the Ministry and other institutions of the Iraqi government. On 20-21 Feb 2017 they held a workshop for veterinarian quarantine and animal’s health departments in Baghdad. Another workshop was held a week later for the Environmental police, Ministry of commerce, General Department of customs and Ministry of Internal affairs. Since the Republic of Iraq joined CITES in 2014, Iraqi officials have had an urgent need for increasing the country’s capacity to implement the requirements for CITES Convention membership, namely controlling Iraq’s border points to prevent wildlife trafficking. 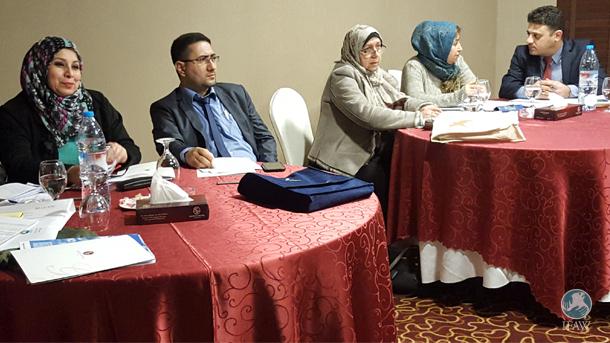 IFAW received a formal request from the Ministry of Environment in Iraq to carry out a training workshop for eight Iraqi officials so they can continue to implement CITES’ programs in Iraq. The workshop was held in Amman, Jordan in cooperation with the Royal Society for the Conservation of Nature. The training was an overview of CITES and how to implement the program. It also covered commonly traded species in Middle East – including big cats, primates, reptiles and birds – cases of wildlife trafficking, smuggling techniques and how to identify the species using the CITES identification guides produced by Environment Canada. There is an ongoing discussion on how to best support Iraq in drafting national legislation. IFAW will continue to contribute and organize additional CITES workshops for Iraqi officials, and Khalaf promised her team will also help further work done by the CITES convention in Iraq. IFAW is honoured to help Iraq increase its ability to combat illegal wildlife trade. As a Programme Manager, Dr. Eissa Darwich supports wildlife trafficking and consumer awareness projects located in Middle East and North Africa.